Sweden's best known walk, a superb wilderness trek in Lapland, well inside the Arctic Circle. Mountains, huge glaciated valleys, winding rivers, lakes; arctic tundra, dwarf forests, lemmings, reindeer and other northern wildlife. You may meet the indigenous Sami people herding their reindeer or in their remote settlements. 440km route, easily done in stages. The northern section is the best, but also the most popular, so huts can be crowded in high summer. Add on a days ascent of Kebnekaise, Swedens highest mountain. The northern sections have good huts, although you can camp almost anywhere. Unpredictable Arctic mountain weather: time your visit carefully, come prepared. The Kungsleden (the king of trails), winds for some 440km (275 miles) along the spine of Scandinavia in wild, remote Swedish Lapland. The trail runs through an enormous area, said to be Western Europe's last major wilderness, passing through a World Heritage Site, four national parks and a nature reserve. The walking season is short: if you want to avoid the horrors of the mosquitoes, it is just August to mid September. In mid summer, you can see the midnight sun. Life here is adapted to the extreme weather. In the lower valleys you pass through pretty, forests of stunted birch and rowan with patches of dwarf willow, fern and willow herb. Higher up, the plant life is still remarkably vigorous and beautiful: ground-hugging shrubs, bilberries to match the best of the Scottish hillsides, vivid patches of reed, a wide range of bog plants and pretty, delicate alpine flowers. Intermittent patches of grass sustain large herds of reindeer. As well as reindeer, you may also see majestic elk, the famous (but normally unremarkable) lemmings and a wide variety of birds. Wolverines and brown bear are also to be found. 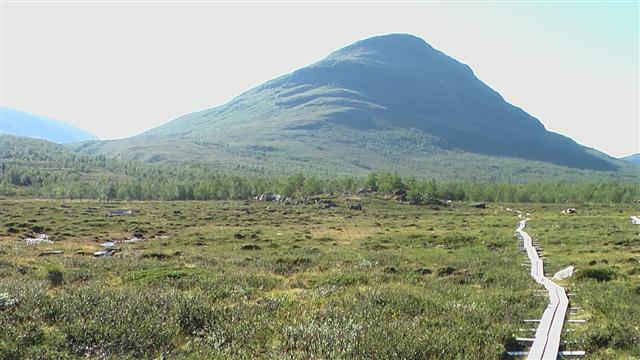 The indigenous Sami people, sometimes called Lapps, are nomadic herders in these high hills. You will come across their villages of red-painted cabins and traditional tepees and turf-covered huts by lakes and rivers, winter pounds for their semi-domesticated reindeer nearby. The Kungledens most popular section, passing through possibly the finest scenery, is its northernmost one, starting at Abisko on the vast Lake Tornetrsk. This section takes around seven days, to a roadhead at Nikkaluokta, the last two days being technically off the Kungsleden. 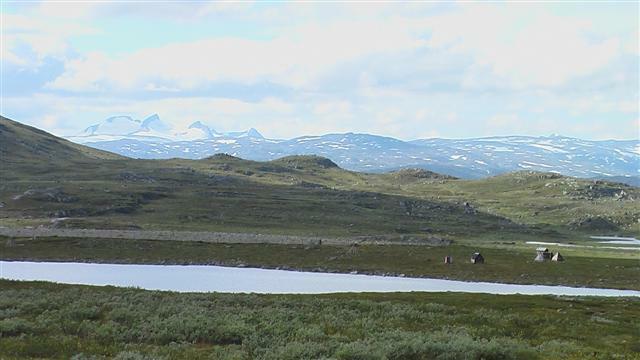 It climbs up two beautiful valleys for three days, then spends two days in the vast, wild, beautiful Tjkjavagge valley, which bisects the highest mountain area in Sweden. These are huge U-shaped valleys lined with sheer cliffs, waterfalls roaring out of higher, hanging valleys along their sides. Lakes fill every scrape-hole and powerful rivers, some milky from their glacial sources, wind, often in multiple channels, along the boggy valley bottoms. 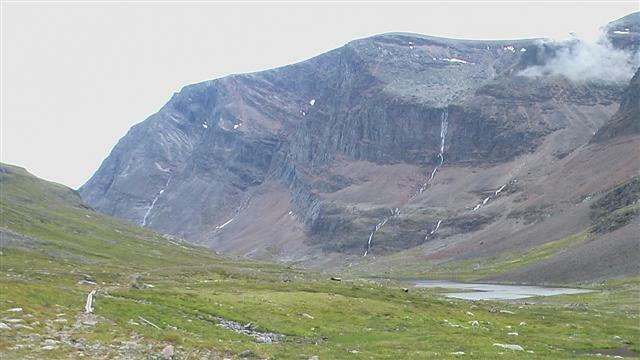 Other sections of the Kungsleden also make superb trekking, and are emptier of walkers, one section not having huts so requiring full backcountry procedures. Some lakes have to be crossed by rowing boat. 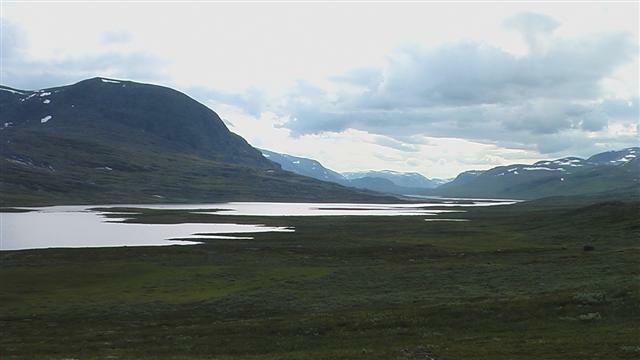 Section 3, going south (Saltoluokta to Kvikkjokk) is particularly fine, at the edge of the wild Sarek National Park. 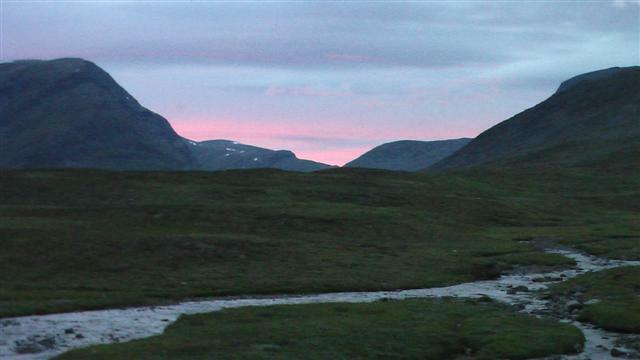 There are good side trips here, and the Padjelantaleden trail links up at both ends. The final stage, in the Vindellvens Reserve, is also very beautiful, with lusher scenery than in the far north. The Kungsleden (the king of trails), Sweden’s most famous long-distance path, winds for some 440km (275 miles) along the spine of Scandinavia in wild, remote Lapland. The trail runs through an enormous area, said to be Western Europe’s last major wilderness, passing through a World Heritage Site, four national parks and a nature reserve. I hiked it twice, in 2006 and 2010, From Abisko to Kvikkjokk. It's trekking inside endless beautiful, wild land, without civilization untill Skierfe Creep: where I see a valley enchanted by primeval forces. Fabio, from Italy. 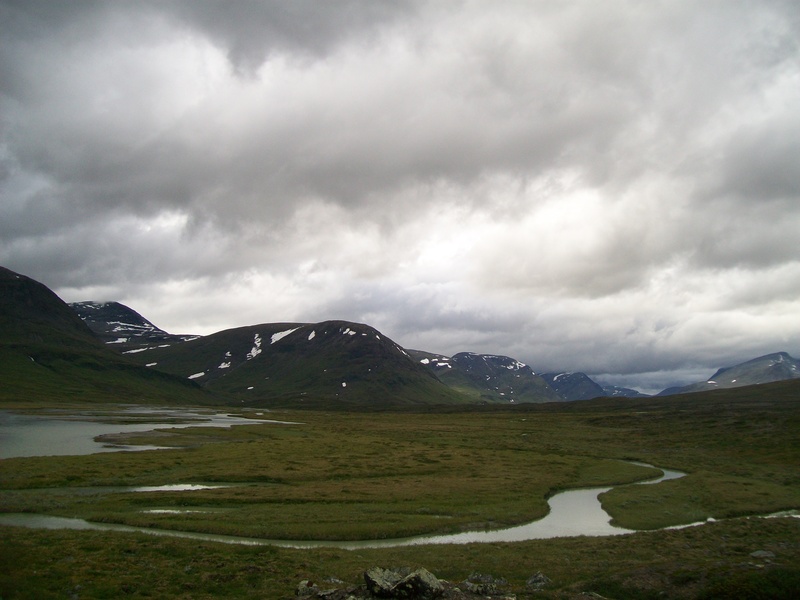 Kungsleden - my trekking in the primeval heaven. What is this beauty that I'm going through? What is this forest enchanting to me? It is an infinite emerald that shines green, eternal lights … the clouds, coloured pink by hidden sun, threaten the green painting the lakes. I have neither hunger nor thirst, my desires and ambitions are drugged, numb. All my chakras are satisfied. I travel towards the dream asleep in a forbidden limbo. Nature, my mother, is satisfied. One of his small essences is back. And it lulls me in a myriad of spells. In Stockholm I risk losing the train but I had to complete logistics for the 15-day of trekking. In the afternoon my train starts running towards the north. I pass the wood portal of the Kungsleden. The knapsack is perfectly balanced and weighs about 21 kg. 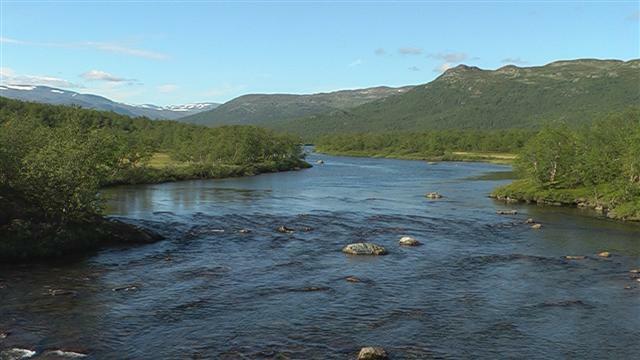 I hike with the Abiskojokk river that, wonderful and powerful, is coloured by primeval blue and green and white foam. I arrive to the feet of Alps; low and alien, majestic and solemn, they roar of the song of different waterfalls carved in dark cracks like quiescent photos. "It's a shame, we have only 200 wolves because Sami shepherds kill them for reindeer!" Of course, poor Sami shepherds that travel by helicopter, must kill the wolves lest instead of running the Mercedes they should drive just BMWs! And those sweet of their wives, instead of 25 jewels could buy only 23! Poor Sami shepherds… thrive while the wolves run for hours in frost to take what Mother Earth has allocated them. My maxim is: wolves free to be wolves, and who knows not live in the forest with the rules of nature that will have to go in Via Montenapoleone in Milan, the place for him. What is this beauty that surrounds me? What is this silence that whispers me? 33 Km inside the wild lands. What can I say of the three valleys that I have crossed? It is an eden. I am blessed in the eden. It is a succession of indescribable beauty. After the brief initial climb the curtain of Scandinavian Alps opens and I enter in the marvel most wonderful of Europe. Seeing the river scroll so, lead so, without the ugly human embankments is a delirium of the soul. Lying at the base of the alps, the lakes are a delirium of the eyes. The Scandinavian Alps, beautiful are one after the other in the endless tundra. They are beautiful and ancient but I to every step, I came nearer and nearer and reached, blinded by their green, I bow to a muse that cannot be narrating with any poetry or any song. What is this dream that surrounds me? 46 km into wild lands. I awake in a dream. I walk with Aleusjokk, the river enchanted by the wild wizard called nature. I must to stop every 200 meters to admire it from a new perspective. The dark clouds surround the pass, 4 km to southern. The rain is strong and wind is powerful. I walk toward the south. The wind blows from there. It rejects me and my quads have to pump surplus of power animal. Reached 1150 meters of the pass I am immersed in the fog. I cross and descend into the valley of Tjaktja. After seeing Tjaktja one man can die in peace. My soul will not regret because satisfied to have seen the mother earth as it was when the world was born. After seeing Tjaktja the soul does not aspire to anything. Tjaktja is the wild paradise, is a rushing and large river flowing eternally free from the levees wetting the tundra around. Tjaktja is an endless valley where distant mountains overlook shining a green abstract charm. 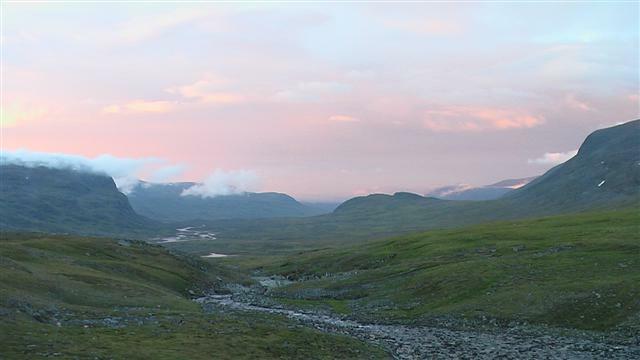 Tjaktja is a prairie of tundra that glides sweet and concave from majestic mountains to the wonderful river. Tjaktja is the roar of the river. Countless waterfalls erupt from the west side of the mountains and flow into the river which runs into endless unknown. 13 km to the most fascinating heaven of the world – 24 hours at the place most enchanted of the planet. 130 km into the wild lands. 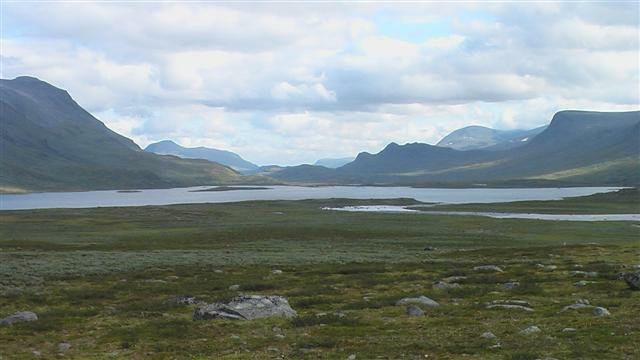 A lake, a slope and a plateau separate me by the Sarek. From the world's most fascinating valley. The mountain most magic of the Earth. My dream. My dream that calls me since always, when I observe the northern horizon from fields behind my house. My dream that tomorrow I’ll bounce back. Camped on the banks of the third lake I have for company gulls that remind me of the sea. I face the spike of Skierfe; beyond, 500 metres below, there is a huge and special ravine. The delta of the Rapadalen, the world's most beautiful river, meanders blue intense between the green marshes. To west, the branches of Rapadalen prowl primordial gate of Mount Nammasj and spread below me, among the marshes, in an unforgettable marvel. The Nammasj is one of the lower mountains I've ever seen. The planet Earth erupts it from his bowels and leaves him there, isolated, between the valley of the world's most fascinating and most beautiful swamp. Around, the Scandinavian Alps shine of ice and snow. The Nammasj is the primordial bastion that separates wild havens of this land blessed by the beauty from the world's most fascinating place. The Nammasj is magical and the aura of an ancient spell hangs on his rock and watch it is a continuous enjoy. The Nammasj is archaic, remote as the earth itself and probably was one of his firstborn sons. Beyond the gate of Nammasj, Rapadalen flows into the taiga between the Alps, inside most beautiful valley of the planet. Every tree, every blade of grass, every moss, every drop of water, every rock gives off a primordial and magical charm that pops up in the air and this magic hood fails to fly away. It remains suspended a few metres above the valley but the air and the wind can't move it. The magic is there, all over the valley, the magic has a thickness and shape but we humans cannot define it or see it. We can only look at it and hear it. There is enjoyment in the enjoying watching the wide valley of Rapadalen. All the world around is silent as if the world were silent for watching the Sarek. I have conquered my dream. Walkopedia member, odd man out, says: "For the Kungsleden, you list the need to carry a heavy pack as a negative. I find that odd that this would be considered a negative for site dedicated to hiking. In this regard, many parts of the the Kungsleden are in fact relatively easy as you do not need to carry much gear. There are fully equipped mountain lodges along the trail so there is no need to pack food or shelter, unless it is your choice to do so." I first heard about Kungsleden in 2000, when I visited Abisko as part of a longer trip round Scandinavia. I wasn't kitted out for long distance hiking then, but wandered along the boardwalks close to Abisko, saw elk, marvelled at the 24 hour daylight, and decided that one day I'd come back and walk the whole route. 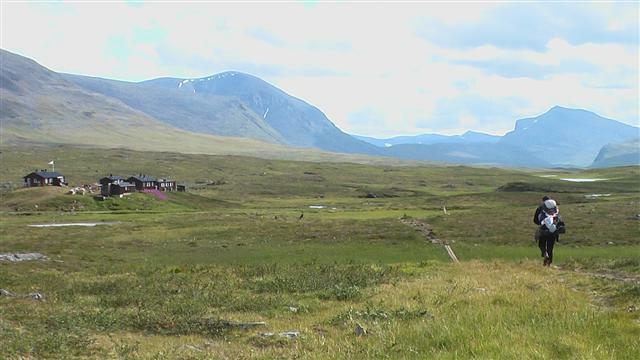 2)Kebnekaise- Vakkotavare (3rd week of July 2015), a short trip, it took me three days, camping the first night at Kebnekaise fjallstation (very crowded), the second shortly before the huts at Kaitum, and a night in the friendly cabin at Vakkotavare- with an invigorating outdoor bucket-shower! It had been a very cold spring and summer, and even at this time I was walking across some extensive snow patches, particularly on the plateau between Teusajaure & Vakkotavare. Because of this the ground was also quite wet underfoot in places. The terrain was very easy going with not too much elevation each day, and as with the rest of the trail, if you're used to walking up Munros in Scotland, or alpine passes, this walk will be relaxing rather than challenging, with plenty of time took look around at the scenery & wildlife: the path is clear and well marked. That said, the decent down to Teusajaure huts is uncharacteristally steep, bouldery and stony, a real knee-jerker. Logistics: There are buses to Nikkaluokta from Kiruna (airport, train station), and you can get a boat part of the way to Kebnekaise, nice as the walk in is a lengthy plod through birch trees. From Vakkotavare you can get a bus to the town of Gällivare which is on the main north-south trainline and has a small airport. You can buy a map for this section at the Kebnekaise fjallstation shop (it sells camping gas/ food supplies too but the prices are extraordinary, so stock up in Kiruna). When I walked it one of the hut wardens would take you across Teusajaure lake on a boat with an outboard motor for a small fee, just waiting for a few folk to gather before he made the trip- pay at the hut. Walko says THANK YOU for this precious info. We MUST get back to do the further stages you describe!